THE BEST DRAW AND SKETCH FOR YOU!! High quality sketching pencils set are perfect for draw, sketch, design. Whether you're a beginner or a professional artist, choose the right tools will good for your work. We offer a 2-year warranty so that you know you'll receive satisfaction and value with our sketching kit. 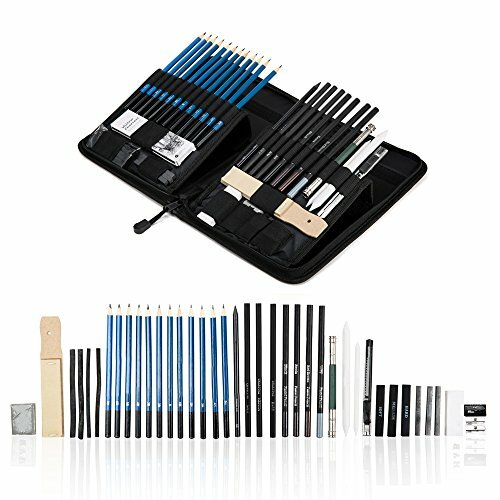 High Quality Sketching Pencils Set: The 40 pcs professional art pencil set including graphite, charcoal and pastel pencils, blending stumps and willow sticks to achieve limitless sketching techniques. Give You Freedom to Create: Designed for writing, drawing and sketching on paper and matte drafting film, portable with zipper case, conveninent to carry. It will keep all supplies in organized when not in use. Perfect for travel , school or at home. We Can Widely Use: A perfect choice for professional and beginner of drawing learning, artists, adults, children, students, it is the best tools to showcase someone's drawing talent great use for figure drawing, charcoal drawing Ideal for art supplies. As Wonderful Gifts: The 40 pcs Sketching pencil set upplies set with drawing art pencils makes a wonderful gift for Christmas, birthday or New Year's gift and more. Sketching pencil supplies for creative in the art. Quality Safety Guarantee: The Sketching pencil set through safety inspection, supplies quality you can trust, so you can rest assured to buy for yourself and your friends. If you have any questions about this product by Wonyered, contact us by completing and submitting the form below. If you are looking for a specif part number, please include it with your message.